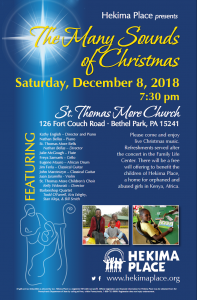 Join us for Hekima Place’s eighth annual Advent & Christmas concert on Saturday, December 8 at 7:30 p.m. at St. Thomas More Church in Bethel Park, PA. 100% of free-will donations benefit Hekima Place. This is a free concert, given as a gift to you from Hekima Place supporters and board members! PLEASE RSVP IN THE FORM BELOW, so we know to expect you. Would you like to support our volunteers and musicians, even if you can’t attend the concert? Make a donation today! Take time from the hectic holiday season to enjoy sacred Christmas music and favorite carols. After the show, stay for complimentary refreshments, raffles, and a craft sale. Bring the entire family! Directed by Kathy English and featuring Nathan Bellas, the concert draws professional and well-regarded musicians from around the city and beyond. Plus, hear a special performance by the St. Thomas More Children’s Choir, directed by Kelly Wdowiak! Help us spread the word by sharing the event flyer and the Facebook event!